G3 Global Grain Group, a partnership between multinational agribusiness firm Bunge and a Saudi investment group, will invest $250 million to become the new majority owner of the CWB, formerly known as the Canadian Wheat Board. G3 Global Grain Group will invest $250 million to become the new majority owner of the CWB, formerly known as the Canadian Wheat Board. The new Winnipeg-based partnership was selected to take over CWB's operations after a process set in motion when the Conservative government ended its marketing monopoly. Farmers who sell their grain through the CWB can receive free units in an independently managed trust, which will hold the remaining 49.9 per cent interest in the CWB. ANALYSIS: Why is the Canadian Wheat Board opposed to a farmer-led bid? Majority partner Bunge Canada, a subsidiary of Bunge Limited, an agribusiness and food company operating in 40 countries worldwide. SALIC Canada Limited, a subsidiary of Riyadh-based Saudi Agricultural and Livestock Investment Company, Saudi Arabia's main agriculture investment vehicle. 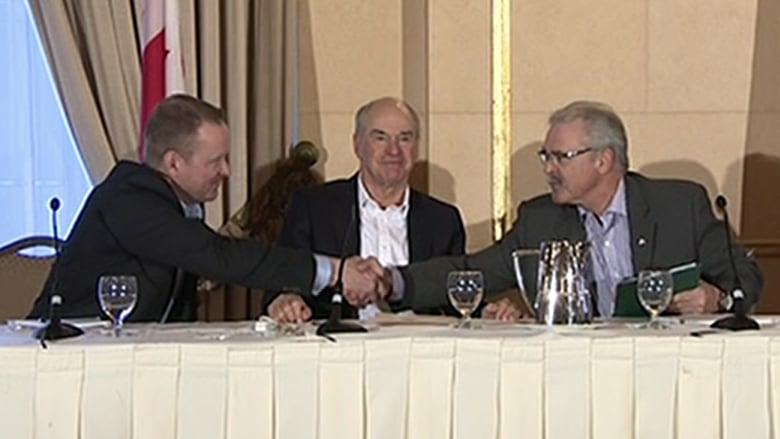 "This is a win for Canadian farmers," Agriculture Minister Gerry Ritz told reporters at a news conference Wednesday, saying it was also a win for Winnipeg's economy that the new company's headquarters would remain in Manitoba. CWB head Ian White and the new CEO for G3, Karl Gerrand, joined Ritz for the announcement. Despite the global pedigree of the companies behind the deal, Gerrand emphasized his roots growing up on a grain farm in Virden, Man. The 2011 legislation that ended the Canadian Wheat Board's monopoly over marketing Prairie wheat and barley gave the revamped wheat board — purged of farmer-elected directors and now run by a board of federal government appointees — until 2016 to come up with a privatization plan and until 2017 to implement it. Otherwise, it would be dissolved. CWB spoke openly of wanting to beat that deadline in order to end uncertainty about its future as quickly as possible. Dayna Spiring, the CWB's chief strategy officer, said the CWB didn't want an investor that already had a "Canadian footprint" (and, presumably, may have been tempted to simply roll the CWB's assets into an existing operation). "One more person in there moving grain is certainly not a bad thing," Ritz said, contrasting it with the situation farmers faced earlier when they were denied the right to decide where to sell their crops. But NDP MP Pat Martin called the deal "the death rattle of a great Canadian institution" and said there was never a good business case for abolishing the wheat board in the first place. "They're not even 'selling' it ... they're just handing it over free of charge to an American agri-food giant and their Saudi partner on the promise that the new owners will invest $250 million in the future," the Winnipeg Centre MP said in a statement. "How is it good business to legislate a Canadian success story out of business and hand over its assets to your former competitors?" Canadian taxpayers provided approximately $350 million to help CWB with transition costs. Ritz said this public money was necessary because CWB's assets were heavily leveraged at the time the monopoly ended. Nothing in Wednesday's deal results in any return for the federal treasury. G3 will assume control over CWB's operations in Winnipeg, potentially by this summer, although the deal has not yet closed. The fate of CWB's downtown Winnipeg office space and current employees is not clear, although White said Wednesday the building itself has been sold already. White will continue as CEO only through a transition period around the deal's closing. Agriculture and Agri-Food Canada tendered a third-party study of the value of the CWB's assets but has refused to release that report. It has also refused to release any financial details of the CWB's operating results since the market opened up in 2012, citing sensitivities around competitiveness. Due to confidentiality agreements, it's unclear exactly which multinational grain companies were in the running or how much they'd offered. A Canadian farmer-investor bid for the CWB by the Farmers of North America group was based on a valuation of the CWB's assets at between $250 and $300 million. That bid was rejected last fall. CWB now operates seven grain elevators in Western Canada and port terminals in Thunder Bay, Ont., and Trois Rivieres, Que. Four more grain facilities are under construction in Manitoba and Saskatchewan. Bunge Canada's terminal in Quebec City and its four elevators in Quebec are part of this deal. However, the new company does not have a port facility on Canada's West Coast, thought to be a weakness in terms of a global growth strategy for shipping more grain to Asia. Gerrand said the company would be looking to solve this problem "in due course." Industry Canada has already given its blessing to the sale, Ritz said, although the Competition Bureau has yet to green light the new investor. Gerrand pointed out that Saudi Arabia is already an important export market for Canadian grain, and SALIC targeted Canada for its surplus of high quality grain. "We're not concerned about a foreign investor," the minister said, adding "every relevant farm group across Canada supports this move." The minority stake offered to farmers is key to the deal's success. No grain company grows without shipping higher volumes of grain received from farmers, so it's now necessary to win their confidence. Farmers used to elect directors to the former wheat board and share in its governance. Its assets were funded with their crop proceeds. A new seven-member CWB board going forward may include a representative from the farmers trust. The minister and the CEOs struggled Wednesday to explain exactly how the farmer trust will work and whether the stake is permanent. The trust will be capped at roughly $250 million, with shares already being allocated to farmers based on how much they sell or have sold to the new CWB since 2012. The farmers' stake in the trust was described as a "gift." After seven years, however, G3 may have the option of buying out farmers. Some or all of the trust could also be sold to future shareholders — that's up to the three-person independent board set up to manage the trust. Why is the Canadian Wheat Board opposed to a farmer-led bid?